Colwell Shelor also handled the construction administration and she quickly discovered that there was not a lot of contemporary architecture locally, so finding someone that could really give it the attention to detail it needed was a challenge. 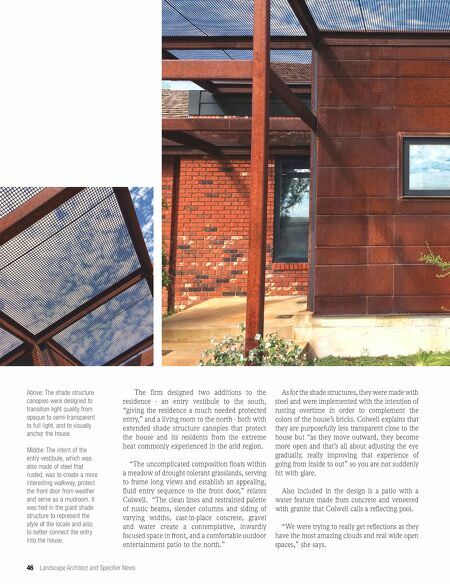 But contractor Ric Marboeuf of Dodge City, Kansas, met that challenge and was able to provide the instruction and guidance necessary to make this project great. As she was in Arizona most of the time during, construction administration from a distance entailed "a lot of phone calls and photos and back and forth to try to understand what some of the issues were," according to Colwell. One of the interesting lessons that the firm learned about the structures was "how to detail for snow and cold weather," which the designers were not familiar with. Above: Poured-in place concrete that was stained with a beige color makes up the front patio. 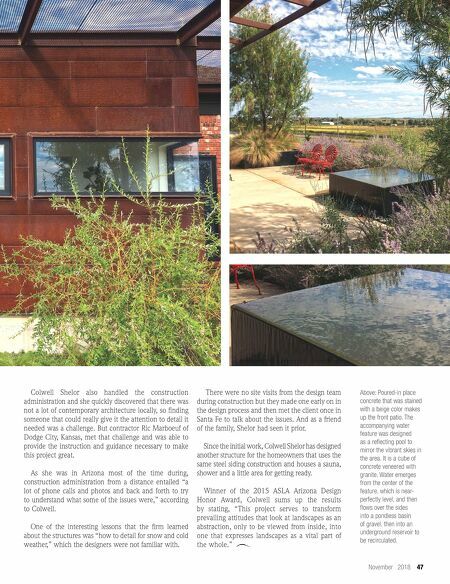 The accompanying water feature was designed as a reflecting pool to mirror the vibrant skies in the area. It is a cube of concrete veneered with granite. Water emerges from the center of the feature, which is near- perfectly level, and then flows over the sides into a pondless basin of gravel, then into an underground reservoir to be recirculated. November 2018 47 There were no site visits from the design team during construction but they made one early on in the design process and then met the client once in Santa Fe to talk about the issues. And as a friend of the family, Shelor had seen it prior. Since the initial work, Colwell Shelor has designed another structure for the homeowners that uses the same steel siding construction and houses a sauna, shower and a little area for getting ready. Winner of the 2015 ASLA Arizona Design Honor Award, Colwell sums up the results by stating, "This project serves to transform prevailing attitudes that look at landscapes as an abstraction, only to be viewed from inside, into one that expresses landscapes as a vital part of the whole."